3.5 out of 5 based on 155 bloggers and 20 commenters. To display the posts date properly you need to change the Timestamp Format. 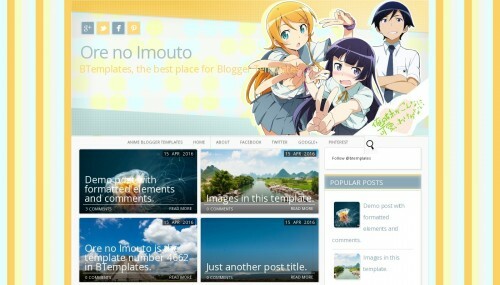 Ore no Imouto is a free blogger template with 2 columns, responsive design, seo friendly, right sidebar, gallery-styled, an exclusive design for Blogger, footer columns, social bookmarking icons, posts thumbnails, pagination, a background pattern, related posts support, well designed threaded comments, cute design, girly looking and geometric motifs. Excellent template for blogs about anime, to write a diary, fantasy or kids. Yah very nice how can create my page? I just land on your blog through google, i read many posts of your blog and i found is very informative! I recommended your blog to everyone on the Blogging World! Hi, i installed this template and is so cool but… How can I remove the words “undefined” from my articles? It should appear the date on it instead of undefined undefined undefined, but I cant find the way to change it, can someoone help me? Thank you for sharing an amazing template. but there is a bug with page’s. Hi is so nice but I have a prob, how can i make to appear all the description on my header on the mobile version? it just cuts Hello I have a question for you.Hi, i installed this template and is so cool but… How can I remove the words “undefined” from my articles? It should appear the date on it instead of undefined undefined undefined, but I cant find the way to change it, can someoone help me?